This guitar is for bowl-back fanatics and mid-to-experienced players. Consistency of sound and projection. Reissued in Europe in May, Campbell’s backing was indeed priceless after some rocky times for the company in the past few years. Founded by Charles Kaman back in 1965, the Ovation acoustic guitars rose to popularity in the early 80s and were played by many of the great musicians of the time - from John McLaughlin to Bob Marley and Joan Armatrading - and continued strongly until it was sold to Fender in 2006. And then sold again in 2015 to Drum Workshop. Named after the country singer song-writer in 1968, the original guitar model was made to be lighter than its steel string counterparts, and was known as the Balladeer. The back of the guitar is Ovation’s signature bowl-back, or Lyrachord back, which was developed by Kaman (who incidentally is the same Kaman of Kaman helicopters). It is a synthetic material or more specifically a “resin-impregnated silicone fiber”, as described in an early sales brochure. 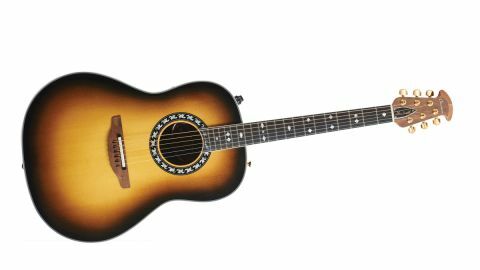 The top is made from grade AAA Sitka spruce and sports a sunburst vintage hue. The finish is gleaming: there’s more reflection here than on a freshly-waxed car (though it’s actually Gloss Nitro Lacquer). The rosette is decorated with a repeating oak leaf pattern, which has been laser-cut from abalone. The walnut bridge looks natural, almost untreated. Sitting on the glistening solid top, the contrast in textures makes it stand out even more. Encircling the top is a white ABS striped binding with black and white purfling. Where Glen Campbell’s original model had a highly varnished neck, this model has a matt, almost open-pore finish to it. On top of the neck, which is a five-piece mahogany/maple concoction, sits an ebony fingerboard stippled with acrylic pearl diamonds and dots and the final 20th fret is signed-off with Glen Campbell’s signature. The headstock is in Ovation’s distinctive shape (looking something a little like a semi-duck-billed platypus) and sports Schaller M6 Gold tuners. Hidden in the shadows of the guitar you’ll find quarter sawn scalloped X-bracing - which is ideal, providing that fuller, more resonant tone in order to complement the natural lightness of sound more commonly associated with spruce tops. Sitting down to play the guitar there is one obvious benefit to the bowlback and that is the way it moulds into your body as you play: it just seems to naturally fill the void between yourself and the guitar. Playing and standing might be more of a hindrance to players with the more voluminous figure, though. While your fretboard fingers have light work on the ebony fingerboard, the thumb struggles a little on the steep curve of the reverse side of the neck for melodic playing. If you like to wrap your thumb around the neck and get into strumming techniques then this is the perfect setup. The width of the neck lets you do this too. Back in the day, the Ovation neck was based around the classical guitar neck, so the nut width would have been even greater at about 52mm, though in this case it is a manageable 43mm. In order to provide an adequate all-round, well-balanced review we set out to compare it with another bowlback guitar. In the whole of Bristol we only source one such instrument for sale - a bespoke, 1982 Kinkade guitar with a Sitka spruce top and a neck design based entirely on a Les Paul: a kooky design, but a benchmark nonetheless. Unplugged it has a clean and understated warmth of tone with almost as much resonance as the Kinkade guitar 35 years its senior, which is impressive to say the least. mid and treble ranges are strong, as is the bass, although taking the lower E string down to a D magnifies the bass immeasurably. A plucked single notes lasts approximately 19 seconds. Although our playing will never be quite up to the same standards of Campbell’s, as seen in his rendition of The William Tell Overture, in which his plectrum work was quite outstanding, we do try our best to replicate as much a sound of his as possible, though it is more akin to a toned down version of American songwriter Jerry Webb’s Wichita Lineman. Our attempts to use a plectrum on this guitar show it to have a strong, full sound with some notable projection. One slight oversight might be the lack of a pick guard, so if you’re thinking of making a purchase of this instrument we’d highly recommend getting one - the top is far too pristine to besmirch, especially if you want to give the guitar some welly. The consistency of tone and balance of sound across the guitar is remarkable. Playing above the soundhole, over the fretboard, even down by the bridge has very little change of tone - it retains its warmth and projection throughout. This is a bonus for players who need that consistency of sound, particularly the more rhythmic player or accompanist. The vibrato is significantly more responsive than on the Kinkade, though not as much as similar priced wooden box guitar counterparts. The current setup of the guitar has a relatively high action. This really adds to pureness of the sound - it feels and sounds as if there are less buzzes and squeaks compared to other instruments. At the top end of the guitar the higher action makes it a little more tricky for adding extra high licks, (it’s comfortable with simple blues licks in the bass) but for strumming in the mid and lower range it feels smooth and clean. A truss rod and supplied key for adjustment allows you to take control of the spacing between guitar and strings. The volume control and equaliser dials are connected to the same single knob SKM pre-amp, the latter above the other, and rotate independently (well, almost). While the volume turns smoothly up and down the EQ dial catches the volume dial in the lower bass range, so you may inadvertently turn the volume down if you need a lot of bass. Too much treble becomes tinny but it is in the mid to lower-mid range that the guitar produces it’s fullest and sweetest tone (which is complementary to the strong mid-to upper range when played acoustically).